9:20 - Activist Andrew Dobbs explains why workers and the poor lose every election - including this one. Andrew wrote the article No, Voting Democrat is Not “Harm Reduction” at Medium. 10:05 - Writer Pavlos Roufos reviews eight years of disaster for Greece under Europe's austerity regime. 11:05 - Organizer Tom Hansen explores the future of socialism and the state under Cuba's new constitution. 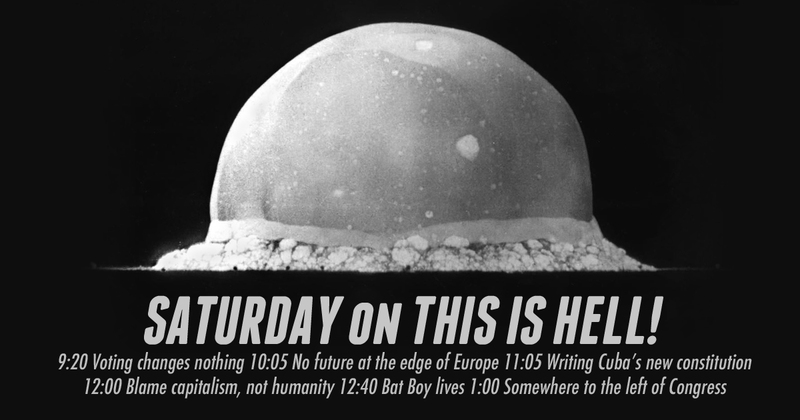 12:00 - Researcher Anna Pigott exposes the engine powering the Anthropocene - it's capitalism, not us. Anna Pigott wrote the article Capitalism is killing the world’s wildlife populations, not ‘humanity’ for The Conversation. 12:40 - In a Moment of Truth, Jeff Dorchen goes - and possibly stays - bats. Jeff told me he's gonna do a cuss towards the end of this one, so hopefully the dump button works or no one is listening. Leah is co-author of the paper Legislative Staff and Representation in Congress in the American Political Science Review.